Sarciado in Tagalog means “cooked with a thick sauce”, that is why this fish dish is accompanied with a thick chunky tomato sauce. Fish Sarciado was invented by Filipinos in search for better ways to make a dish out of left over fried fish as these leftovers are not really as appetizing as the freshly fried ones, so an ingenious approach by adding tomato sauce and eggs did made the trick by not just rehydrating the fish but as well as removing the fishy odour and adding more flavour to the leftover. Having said that there’s nobody stopping you to cook this using a freshly fried fish, you can also use any fish you want as the sauce works with almost every fried fish I had tried like Mackerel Scad (galunggong), snapper (maya maya), grouper (lapu lapu) and even tuna. So the next time you have a fried fish or any left over fish and is planning to bin it try this dish instead. Add tomatoes and continue to stir fry until tomatoes are soft. Add water, tarragon, thyme and fish sauce/sea salt (according to your taste). Bring to a rapid boil. Once boiling add fish simmer for 5-8 minutes (depending on the thickness of the fish) then remove the fish and place on plate. Back to the wok; add the beaten eggs mix it together with the sauce. Turn the heat off and pour sauce over plated fish. Season with freshly ground black pepper and garnish with spring onions. What an interesting dish – I love fish! Great philosophy! Nothing gotta be wasted. We use a similar method to use left over fried meat, as well. To me it’s genial. You can have two dishes out of one! I’m always looking for new ways to have fish – this looks terrific ! For me, nothing beats dalagang bukid when it comes to sarciado! Sarap! Though I haven’t tried incorporating your last two ingredients, tarragon and thyme. Time to make some revisions on my old recipe. Thanks Raymund! Yum- thick chunky tomato sauce? Sold! I love how I always learn something when I read your blog! this fish recipe will be very popular at my home as we tend to eat fish most of the time. Thta look so delicious, fish is good for our health and brain. Nice recipe! I love converting leftovers into something else. This looks very flavorful. this is the real tagalog sarciado! 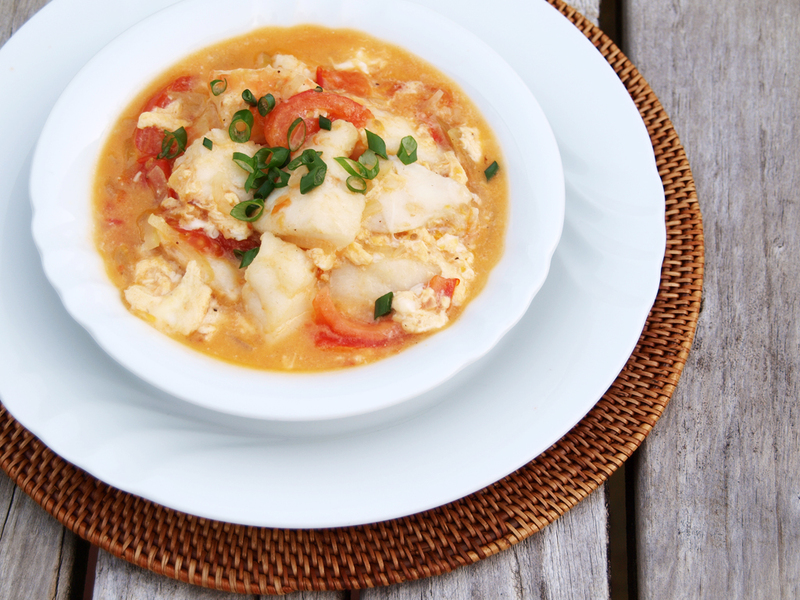 with a very little variation — we usually let the fried fish “stew” a little bit with the sauteed tomatoes.. then we add the eggs, letting it stick to some parts of the fish.. yummy!!! Oh and I didn’t have any tarragon so I used ground corriander, ground cardamon, white pepper instead of black, and some bay leaves. Thanks for the great recipe! 🙂 indeed one way to bring leftovers to a great taste!